Windows Explorer is not responding, this bug is common in every computer. There is always a situation where we see this error. I was feeling bored so I thought of making a post on this so users can get a solution. The solution [present here] doesn't require reboot or shutdown. You can follow this without any reboot, means your work will be safe, I can guaranty that. Credits goes to me for capturing the ScreenShot. When this kind of error appears, click on Close the program because it can take much time to respond back again. I always select Close the program because I know it will take much time. However, it depends upon you. If you're copying/moving/browsing any file or folder then please click on Wait for the program to respond else it will be closed and your work will be unfinished! Nothing, but a computer with mouse and keyboard. The solution will work on Microsoft Windows XP, Microsoft Windows Vista, Microsoft Windows 7, Microsoft Windows 8, Microsoft Windows 8.1 and on any variant. 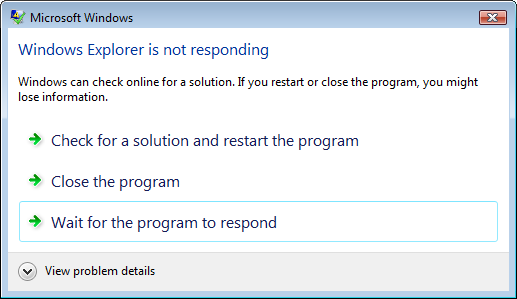 When the popup with the error appears click on Close the program and wait for some seconds. Credit goes to me for capturing the picture. 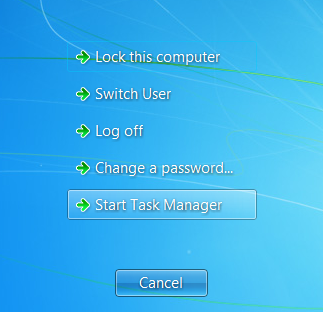 Click on Start Task Manager. The task manager will open soon. Credits goes to me for this picture. Click on New Task (Run...). Credits goes to me for capturing the picture. You will see your taskbar, desktop and everything back :) Enjoy! Still have questions? Don't worry. Shoot a comment below in the comments section. Hope you fixed the error and enjoying your PC again.